NEW line of Omega-Bond product! 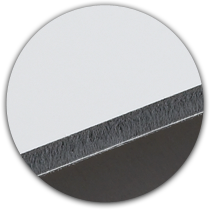 Solid core aluminum composite panels designed specifically for fabrication applications! The .012" Omega-Bond Premium features a .012" aluminum skin thickness and higher quality plastic core that is best suited for your fabricated projects! The thicker gauge aluminum is optimal to achieve best results for fabrication projects. Routing and bending the panels is now easily accomplished. Specially treated for optimal flatness before and after bending, by taking out all possible tension/stress from the panel itself. Maximum durability is achieved since the solid polyethylene core has fewer impurities and lesser recycled content. This allows bending and cutting without breaking the core during the fabrication process. The .012" aluminum provides structural strength and allows 3-dimensional shapes to be achieved without an inner support or frame. Various architectural signage, decorative canopies and cladding solutions can be easily fabricated for retail shops, restaurants, banks, car dealerships, etc. Class A fire rating - passed ASTM E84-16 Standard Test Method for Surface Burning Characteristics of Building Materials.